Welcome! A visit to the Scottish Tartans Museum and Gift Shop in the Smoky Mountains is a stroll through the history and culture of Scotland. Located on Main Street in downtown Franklin, NC, our museum showcases a large gallery of tartans, kilts and Highland dress history, as well as an expansive gift shop. Our museum was founded by the Scottish Tartans Society, formed in Scotland in 1963 to "study the origins, history and development of tartans." Our Museum focuses on the history of Scottish Highland clothing, specifically the development of the tartan and the kilt. Other exhibits also cover various aspects of the Scottish emigrant experience into North Carolina, specifically their interactions with the Cherokee people native to the southern Appalachians. Visitors to the museum can learn about the Scottish emigrants to our area, discover their clan or family tartan, and gain an appreciation for the richness of the traditions surrounding the Scottish National Dress. Our gift shop features many unique Scottish gift items, including books, music, jewelry and more. We offer a full range of custom Highland Dress items to get you outfitted from head to toe. Every purchase helps to fund the museum! We are also supported by membership, so we hope you will consider joining us. 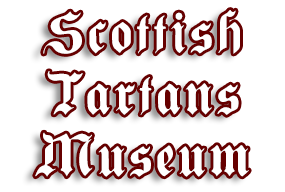 The Scottish Tartans Museum is a 501 (c)3 non-profit corporation. We are open year-round, six days a week (except for major holidays), so please plan a visit to the Scottish Tartans Museum the next time you come to North Carolina's Great Smoky Mountains!